The fact that many organizations are considering to hire managers with a military experience is that they are more experienced with dealing and guessing who will be valuable and who will degrade the company. They function with their intuition and are responsible with the courage to communicate without fear. They are well educated and are experienced in working in whatever situation you give them. One with military experience knows how to function in diversity and to maintain one as they think globally and are adaptable. Such features of the military veterans have attracted many organizations to bring success in their fate. Following are the advantages in hiring a manager with military experience. The person in military is trained to make decisions keeping in mind unanimity and coherence at the same time for a team of people. Corporate organizations too need such a decision maker who will be able to extract productivity from the whole team in a directive method. The collective output is a mission of military so is for the corporate organizations and team performance is the high priority in both grounds. Managers are the one who are given assignments and who decide collective responsibility at the same time disseminate tasks and responsibilities to each individuals and thus in a cooperative way each contributes to the ultimate success. This attribute of quick and spontaneous decision making and distribution of tasks swiftly is highly a proficiency that military veterans excel in. Military personnel are essentially loyal. Business leaders and corporate organizations require employees who are loyal to the company. Military personnel have in them inherent perception of how loyalty augments to team competence and develops trust in a work environment. For business leaders who are looking to make a wistful long span of investment in an employee, military personnel often outshine other candidates as verified team performer. Such personnel bring with them hard work, enthusiasm and commitment. Considering importance of sticking to a schedule and reliably performing well at work illustrates expertise. It becomes difficult to identify this in the candidates by business leaders. Through training, lifestyle and typical service the former military veterans will essentially have these factors of work ethic in them which the corporate owners seek. It will be appropriate to hire a military veteran of such skills and work ethic to influence others in the company. For company employers searching for veteran professionals with strong work ethic, military personnel should be the prior consideration. Diversity is not only contemplated well by military personnel but they are well aware of benefits of effective communication. Most of the military veterans not only speak more than two languages but have been traveled expansively and understand the degree of international interactions. Company owners who are planning on global markets and to target global mass, military personnel should be the person to be hired. Military veterans are also professionally aware of the technology used extensively for mass communication and excel in technical literacy. Trained military personnel are also well qualified with regards to writing and professional interactions which have made them realize how effective communicating accurately and concisely bears fruit. The military veterans are adaptable to different works assigned. They are quick in learning and accustomed to accepting challenges. Thus it is very beneficial for the employers as this will mean enhanced productivity and flexible work capability. Military personnel are regularly obligated to learn new tasks very quickly under high stress and anxiety. Its outcome is the increase of an accelerated learning arch, which means training in very less period. As ex-serviceman mandatory drug and physical testing is done which ensures healthy and energetic employees with very less sick duration. Generally other than the rest of the candidates, military veterans have more fitness. Moreover zero drug tolerance policy is followed by the military personnel that confirm addiction free employees. Workforce free of addictions and healthy lifestyle reduces lost time period for recoveries. Working under pressure and stress is consistently practiced by military veterans. An inability to do so puts them in severe consequences. The military veterans are habituated of deadlines and working under tight time schedule. For the employers this trait becomes highly influential. They need the workforce to be competent even in the times of stress and anxiety. From the first day of training of military veterans they have been trained to work in a disciplined manner. They exercise this discipline till the time of retirement and more. This can be applied in corporate organizations too. Employers are pleased with candidates who are punctual, safety aware, focused, control and optimist. For such employers hiring military personnel is apt. Employers seek in the candidates leadership qualities as a manager. Military personnel learn leadership practice through educational and theoretical study. It is exercised by military veterans as a matter of endurance. They tackle with many people who are even incompetent as firing is not even an option given to them. Thus it becomes inevitable how military personnel leaders tackle even the most inefficient to the best of their success and which can even be the quality desired at corporate companies. The military veterans are the most responsible people one can find. This can be evaluated from the fact that they do not give up responsibilities and work even without any holidays or breaks. A single blunder causes them severe sacrifice. Thus they do not mess up at any cost which ultimately runs through their veins. Thus employers are most benefited in hiring such military veterans as managers since they consider work seriously and take it responsibly. With proper training and framework the military veterans excel in the work assigned. Military veterans are highly skilled to work independently, thus naturally able to solve complications. They do not seek for outside support when provided with adequate framework. The personnel are resourceful and know the best asset to achieve the laid goals. This makes them business friendly and aids them to help grow the employers company. Many companies have grown global and diverse cultures and people from various lifestyle and background come together for an equal effort for success. For this the employer would seek a manager who can tackle different sets of individuals with dynamic personalities. The military personnel have worked towards achievement with a diverse set of team. The military focuses on achievement and by accumulating their methods employer’s will increase the team’s efficiency. Military personnel are habituated and comfortable in a diverse workforce and adapted to work with such a group to achieve success. Military veterans are used to changing times, places and team as well as technology. It is a necessity for them to be adaptable to situations. Employers will be benefited from someone who adapts to any work given, any type of people made to handle and even work with inadequate resources. Military personnel are well known for such adaptability. The military updates the technology repeatedly with advancements in discovery of new techniques and the veterans are supposed to adapt to the new technology. Enduring even at the face of limited resource is a quality the military veterans hold. Military is a community wherein the culture developed seeks accomplishment of mission. Employers also try to build a culture that unites for the greater and maximum accomplishments. With military personnel it should become very easy to attain such a work culture. They give their loyalties, they never stop the hardship, and they believe in the strength of a team and can sacrifice for others. If such a manager is hired for the company it will be constructive of a culture where team will work cooperatively and contribute their best to the organization. Military personnel have come across situation of war, uproar and devastations. They have seen either their own or others life turn topsy-turvy and upturned. Such situations should not be handled with uncontrollable emotions by the veterans. And so the veterans practice strong emotional drive to overcome such faces of crisis. In a corporate company success and failure will keep taking turns, however military personnel will not be affected with it. To summarize, military veterans are a special and distinct breed and they have all the attitudes and approaches that good companies are in need. Persistence, intuition, dependability, competence, accountability and leadership all are part of a culture built on completing the job. At the same time they know most of the global cultures and have met with many people around the world, which will only add to the benefits of the company’s growth. The military personnel are each a bounty of beneficiaries due to their training process, education and skills development programs. 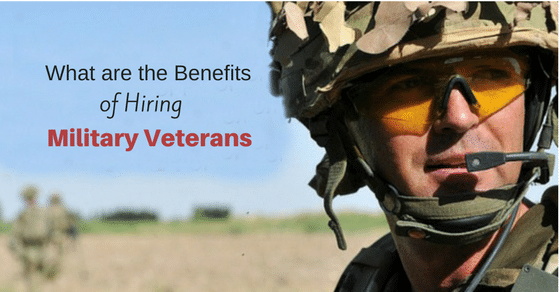 Research and Studies and some subjective evidence all indicate to the value of hiring military veterans. Previous articleHow to Overcome Lack of Industry Experience in Interview?